Dec - 04 | By: Dustatron | no comments. 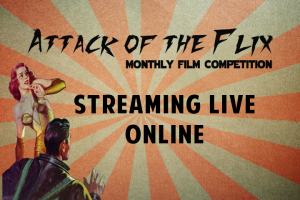 Join us at Curious Comedy Theatre, every third Sunday of the month for Attack of the Flix – a competition for Portland filmmakers with short films under 10 minutes long. All films must be submitted on USB thumb drives, nothing is screened before hand! Admission is free (donation suggested), full bar, all ages venue. Join us for an upredicatble night of art, comedy, drama, and sometimes horror! Screened live on the interwebz! Eat, Drink, and Enjoy in a Dinner Theater Environment! Admission is Free and for all ages! There is a $5 suggested donation at the door, all of which goes back to support MicroFlix film events. Submit your film an hour before the event starts (7pm). Submissions must be on a USB thumb drive encoded in Apple TV format. Bring yourself, your friends, and/or your short film! The short films presented are not pre-screened and are played in the order they are received. All movies should be made by a Oregon or Washington resident. We never know what we’re going to see, so be prepared to surprise and delight! Vote for your favorite flicks! The first place winner gets a golden trophy! Curious Comedy Theater is an all ages venue that has a full bar, complimented by an ever-expanding and always delicious food menu. MicroFlix is Big Support for Micro-Budgets. We’re an organization dedicated to supporting micro-budget filmmakers by getting their work seen in front of live audiences as an alternative to an increasingly noisy online-only world. MicroFlix believes that there is still something unique and useful about seeing your short film efforts in front of real people. Preferably strangers! To facilitate our support for filmmakers we focus on assisting others in getting short film events up and running. We’ll lend our support, guidance, and experience to anyone who wants to run their own event. See www.microflix.org for more information! The mission of Curious Comedy Theater is to improve the lives of kids, adults, and seniors through the art of comedy.